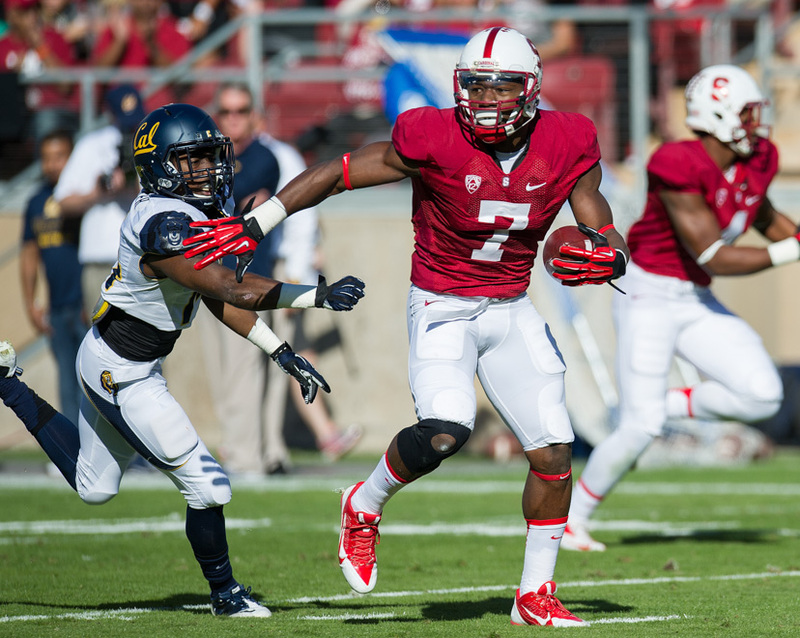 STANFORD, CA - November 23, 2013: The Stanford Cardinal vs the Cal Bears at Stanford Stadium in Stanford, CA. Final score Stanford Cardinal 63, Cal Bears 13. In a rematch of last season’s NFC championship game, the Green Bay Packers took on the Seattle Seahawks in a game that would feature three Stanford alumni: Ty Montgomery ‘15, Richard Sherman ‘10 and Doug Baldwin ’10, all of whom played critical roles in the closely contested game. While Sherman and Baldwin are used to the spotlight that players face in big games such as Packers-Seahawks matchups, experience did not necessarily translate to success in this case. Surprisingly, it was All-Pro cornerback Richard Sherman who struggled the most Sunday night, while Montgomery, a rookie who has become a more integral part of the Packers’ offense after Jordy Nelson and Davante Adams went down with injuries, made some clutch plays to help the Packers earn the win. On the first drive of the game, Sherman was overcome by Green Bay receiver James Jones for a 29-yard touchdown. While it turned out to be Jones’ lone catch of the game, it gave the Packers the early 7-0 lead. The Packers took a 13-3 lead into the half, but the Seahawks were able to battle back in the third quarter thanks to Baldwin, who led all Seahawks receivers with 7 catches for 92 yards. Halfway through the third quarter, he gave the Seahawks their first lead of the game via a 13-yard touchdown pass. The Packers, however, would not be denied their chance at redemption, as Montgomery made two key plays down the stretch, helping the team prevail. Down 17-16, he turned a 3-yard pass into a 17-yard gain, bulldozing through several Seahawk defenders and moving the ball into the red zone. Later in the quarter, after the Packers had regained the lead, Montgomery helped convert a 3rd-and-6 with a 10-yard reception to close out the game and improve the Packer’s record to 2-0. Meanwhile, the Seahawks dropped to 0-2 for the first time since 2011, when Baldwin and Sherman were both rookies. Monday night featured more Stanford alumni action as the Indianapolis Colts sought their first win against the New York Jets. The Colts, who have five former Stanford players on their team — Henry Anderson ‘15, David Parry ‘15, Coby Fleener ‘12, Griff Whalen ‘12 and of course Andrew Luck ’12 — struggled mightily against the visiting Jets, whose roster includes Chris Owusu ‘12. While rookies Anderson, who notched a sack, and Parry performed well on the line, Luck continued to play a form of football that football fans haven’t seen much from him: He went 21-of-37 and had three interceptions as well as a fumble against the Jets. Through the first two games of the season, he’s thrown 5 interceptions and only 3 touchdowns and is good for an abysmal 58.9 quarterback ranking. The Colts’ early season struggles and 0-2 record subdue talk that the team is likely to be in or win the Super Bowl. Contact Michael Woo at mtwoo ‘at’ stanford.edu and Alexa Philippou at aphil723 ‘at’ stanford.edu.